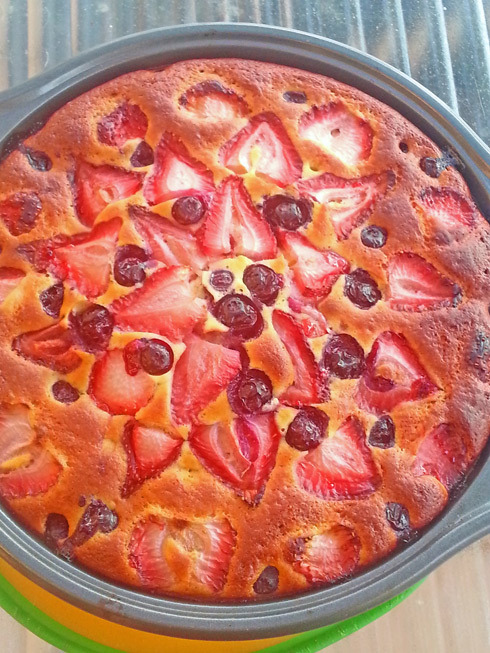 The recipe of this wonderful, very berry pretty, light, and absolutely delicious cake has been floating around the immenseness of Facebook cooking groups since May, with the original post by a very kindhearted lady Yelena Baraz. 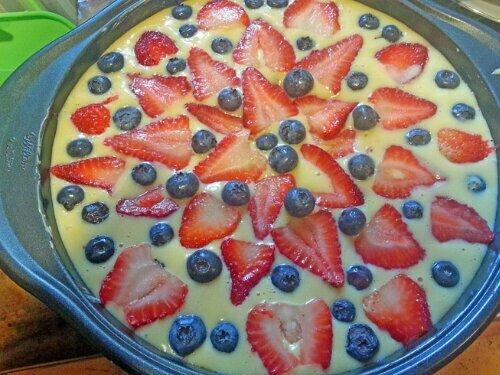 Another wonderful lady, Svetlana Krayz, has made this cake many times for her family, that fell in love with it, and posted the recipe with her tips many many times, I however always missed the opportunity to write the recipe down, before the post got pushed down with new content. Yesterday was my lucky day – another community member made the cake again and posted the recipe, as I was looking through the group. Of course I had to make it, especially since I had a bunch of my sons friends over helping with moving stuff from the basement, and the cake was a great way to show them my appreciation. What can I say – they loved it and I will definitely make it again over and over. 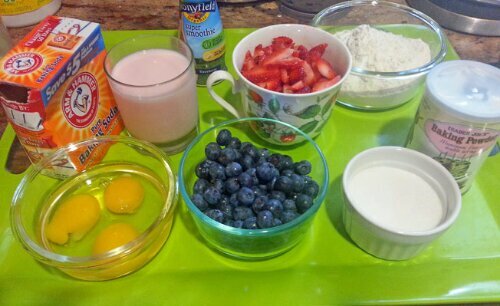 In a separate bowl mix eggs with sugar- by hand, or with a mixer , add kefir with baking soda, baking powder mix. 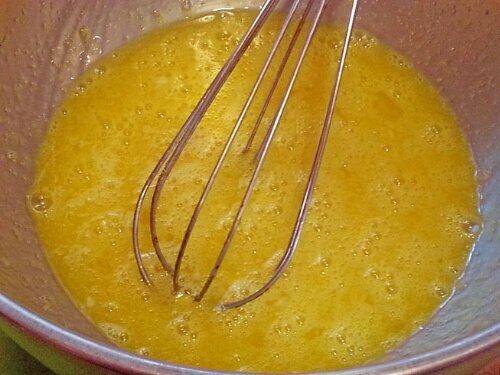 Add the flour to the liquid, do not overmix. 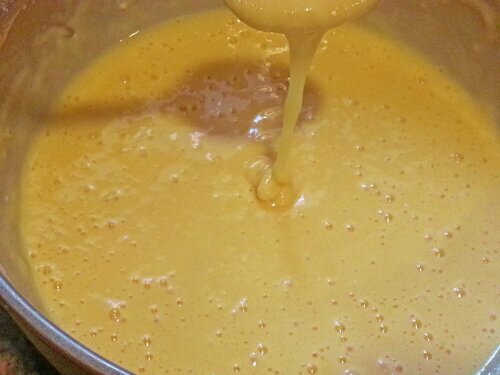 The dough should be the consistency of thin sour cream, or kefir. It’s a very light dough. 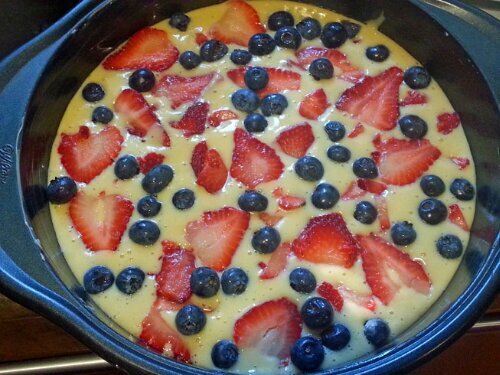 Grease a 9″ cake pan, add half the dough and layer 1/2 of the berries on top. Bake at 400 about 30-50 min. Check the cake after 30 minutes, I forgot to do so and the cake got a little discolored, even though it didn’t burn and tasted AMAZING. Making it as of now. Having the right cake pan is super important! Thanks for yet another great recepe! Than you, they were AMAZING!